Walking is a natural behavior for dogs, so what is the big deal about teaching them to walk nicely on a leash? It shouldn't be that hard, should it? Yet dog trainers all over the world always have clients with this problem (almost single-handedly guaranteeing the trainers' job security!). Leash-pulling is a problem that even some of the best trainers are unable to solve for their clients, despite the latest and greatest "no-pull" equipment that offers a helping hand. Once and for all, wouldn't it be nice to find the technique that can solve most leash-pulling problems? A systematic and basics-focused approach to training loose-leash walking can lead to greater success. With an emphasis on foundation behavior skills, realistic expectations, solid leash mechanics, the right equipment, and a relaxed dog, your chances of training a praise-worthy walking partner are increased. Be willing to start at step one and progress slowly. This article, part one of two, will describe the best preparatory steps. Loose-Leash Walking: Part Two, to be published next month, will delve into the step-by-step instructions for training the behavior. Do not underestimate the power of a thoughtful completion of the opening steps in part one to influence positively the training steps to be described in part two! "Build good foundation behaviors," is a very common instruction from positive reinforcement trainers. The analogy is that of building a sturdy house. If you build a strong foundation under a house, it will be rock-solid, but if you build a shaky foundation, at some point that house will crumble. Loose-leash walking is just like that; build strength under the goal behavior with foundation skills and the rest should fall into place. But there is a problem defining a foundation in dog training. Not everyone agrees about what a strong foundation looks like, and about when construction on that foundation should commence. Reasonable expectations regarding the amount of training time and the steps involved with training loose-leash walking for a lifetime need to be set, too. For training to be successful from the outset, the person on the other end of the leash needs to have a grasp of the commitment it takes to garner solid loose-leash walking skills for a dog. A commitment to teach any dog positive leash-walking skills begins with expectations—whether the task is remedial leash-walking or getting started on the right paw with a new dog or puppy. If the handler prefers a closer stance and more emotional contact with the dog, training might take more repetitions and more patience in order to reach that level. Dogs that are more concerned about their environment might benefit from walking closer to their handlers, allowing the human to set the pace and make decisions about when to take breaks to sniff and/or potentially greet people or other dogs. For these dogs, the learning curve may be higher and require a tighter set of skills. Of course, those facts necessitate a longer training commitment, but a commitment worth the effort in the long run. Finally, there might be a need for a combination of both styles—asking the dog to walk in a tighter heel as needed and more casually at other times. Note that addressing leash walking for competition or for dogs that are reactive on leash is not the focus of this article. However, all well-trained leash skills can be moved to those arenas if desired. The foundation behaviors are the same. Gathering as much information as possible about the dog is important so that the handler or instructor can work successfully with the dog. Knowing the dog, and thoroughly examining the dog's past history of leash walking, helps to unravel complaints about how the dog walks on leash. It's also important to discover what maintains the leash-pulling behavior, or what makes dogs stop in their tracks and refuse to move forward. How long has the dog been pulling on leash, and to what degree? What kind of equipment has been used on the dog while walking on leash? Is the dog pulling right away, as soon as he steps out the door? Is the dog ramped up when the leash comes out? Is the dog able to eat outside of the house? How long are typical walks? Does the dog ever relax, calm down, and stop pulling during a walk? The answers to these questions can become the start to a training plan to overcome leash-walking concerns. A big and powerful dog with a long history of dragging people around on a leash and with a history of punishment training will be more of a challenge than a young dog just beginning to learn about walking nicely on leash. Plan accordingly. If a dog won't eat outside of the house, the dog is not ready to be working outside. The training program for this dog should be stepped back in order to clarify the problems. If pulling out the leash causes a dog to turn into a bucking bronco, start reviewing and adjusting the training routine just before that step. If a dog overreacts at the very sight of the leash, it's time to make the leash less exciting but more reinforcing in a different way. An overwrought dog is not completely cognitive; trying to walk a dog in that state only serves to reinforce the same behavior each time you pull out the leash. In other words, the dog comes to believe that behaving wildly is what makes the coveted walk happen. Always start where the dog is successful, attentive, and relaxed. Always start where the dog is successful, attentive, and relaxed—even if you are just beginning to work on a dog's leash walking—rather than trying to train in a crisis. "Habits are formed as a 3-step process. This process within our brains is a three-step loop. First, there is a cue, a trigger that tells your brain to go into automatic mode and which habit to use. Then there is the routine, which can be physical or mental or emotional. Finally, there is a reward, which helps your brain figure out if this particular loop is worth remembering for the future: Over time, this loop—cue, routine, reward; cue, routine, reward—becomes more and more automatic. The cue and reward become intertwined until a powerful sense of anticipation and craving emerges. Eventually, whether in a chilly MIT laboratory or your driveway, a habit is born." This explanation makes it clear why dogs not only go crazy when the leash is presented from the same location each time, but how simply reaching toward that location will become the trigger over time. Move the location of the leash as a first step, and then change what reaching for the leash actually means. The next step, which is so reinforcing in the sequence, is clipping on the leash while the dog is squirming and thrashing—and that step ultimately leads to going for the walk. Think about it this way: each piece of the sequence serves as reinforcement for the step before it. Reach for the leash = Clip the leash on = Move to the door = Door opens = Step outside = Major jackpot for the dog. Now think about how the sequence plays out in a dog's mind—behaving all wild and crazy is how to make that entire behavior chain happen over and over! This conclusion by the dog is why it's important to work when the dog is still under threshold and able to think. Learning to walk nicely on a leash cannot occur if the dog is over the top. To change the sequence you need a more relaxed, thinking dog. The beauty of teaching a new behavior chain is that the dog can still earn the "jackpot" of going for a walk. The dog earns the jackpot in a different way, but does not lose the reinforcement. The dog gets the reward in a different manner. One of the easiest steps in the quest to improve the leash-walking process is to teach a dog that the leash means sit. One of the easiest steps in the quest to improve the leash-walking process is to teach a dog that the leash means sit. 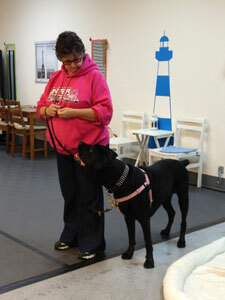 Sit is a great behavior to teach, no matter how a dog behaves when the leash comes out! If a dog has a solid sit, it's just a matter of transferring the cue to the leash. If not, teach the sit first. When your dog has a solid sit behavior, all you have to do is switch the cue for that behavior to the leash. To do that, use a "new cue, old cue" process. Show the dog a folded-up leash brought out from its new location. The leash will be the new cue; quickly follow its introduction with the sit cue. When the dog sits, click and treat. Repeat these steps 5-10 times, and then try dropping the verbal cue "sit." Simply present the leash and wait. The dog should be anticipating the sit, and will fold back into the position. When he does, click and treat. The leash gains a new meaning; it is the cue for sit, and not a trigger for leaping and screeching. Practice a number of times more to ensure that the dog really has the new cue down. Take breaks after 5-10 trials. When the dog truly understands the new cue, move it around to different areas in the house; this will help generalize the cue. The leash gains a new meaning; it is the cue for sit, and not a trigger for leaping and screeching. After practicing with the leash in a number of areas (try approximately 10 locations, which can just be moving from room to room and shifting position in the same room), then it is time the next step. Next training session, unfold the leash just a bit. Since the leash will look a little different, you might have to wait a bit longer for the sit response. If it seems like the dog doesn't get it, go back to the "new cue, old cue" process. Repeat these early steps with breaks between training sessions so that the dog has time to process. Be sure to generalize again. The goal is to keep unfolding the leash until it dangles, holding just the clip/fastener. When you reach that point, again transfer the cue, this time from the leash to clipping the leash on the dog. The cue will still lead the dog to sit. These training steps may seem like a slow progression, but if you keep the unwanted sequence in mind as you proceed, you will appreciate the process. If at any point the dog believes his crazy behavior will result in going for a walk (no matter what part of the sequence that happens), you are reinforcing the entire sequence, a sequence that leads to extreme pulling on leash. For this next step in the training plan, put the dog away and practice the mechanics that are necessary for good leash walking. Many people believe that holding the leash is about their own comfort, but it's much more than that. Rather than trying to control the dog, what you should be striving for is cooperation (not restraint). Using your core, your center of gravity, is the best way to protect yourself. This way you can prevent the pulling a dog can do when your arms are stretched out, elbows straight and your weight off-center. Keeping your elbows bent and tucked into your midline helps you stay balanced—and helps you hold on to the dog should he get to the end of the leash. This strategy is important, since the dog learns quickly that pulling, and then pulling harder, causes you to step forward. That in turn reinforces the pulling, and a vicious cycle is started or maintained. The proper way to hold a leash. Another skill or practice is to avoid putting your hand through the leash loop. While some people feel more secure that way, that grip discourages keeping your arm tucked in and your elbow bent. When you let go of the leash after putting your hand through, the leash is free on your wrist and the dog can more easily move in other directions. 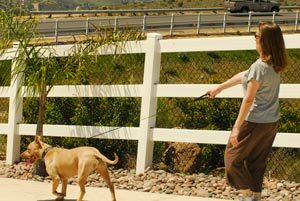 Looping the leash handle over your wrist also puts you in danger if your dog takes off and pulls or lunges on the leash. Many people have been injured when a dog pulled them over and the leash was stuck around the wrist. Two of my clients suffered serious injuries (injuries that led them to become my clients!) when the leash was over their wrists and they were unable to let go. One broke her finger, a break that required surgery. The other was dragged on her face on the ground for several hundred yards, an accident that necessitated reconstructive surgery on her nose (her powerful Lab went after a cat). It's far better to hold the leash with the leash looped around your thumb or forefinger and the balance of the leash gathered in your hand—just in case you need to let go. It's hard to talk about leash walking without talking about equipment. But, the goal in teaching cooperative leash walking is to work as though there is no equipment on the dog at all! Gear is not what makes good leash walking. Good training does. Leashes, collars, harnesses, head halters, and more help keep dogs safe, comply with the community laws, and can prevent some unwanted behaviors. However, the real aim of teaching your dog to walk on leash should be walking independent of equipment. With that in mind, equipment should be as comfortable and non-invasive as possible. Gear is not what makes good leash walking. Good training does. One problem with equipment is the potential for positive punishment, which sometimes can be extreme—and not conducive to good leash walking and the relationship it requires! Consider how punitive it is when a dog lunges on a pinch collar. The correction is harsh. The same goes for choke chains when a dog pulls or lunges. Body harnesses are less likely to be painful or punitive, although they can still be aversive. They do offer a way to move a dog if necessary. Front-clip harnesses, like the Freedom Harness, or the Perfect Fit Harness, offer a different design than a typical back-clip harness. Many front-clip harnesses can be used with two points of contact to help balance a dog's weight a bit better. The design goal of a front-clip harness is to make the center of gravity on the dog more manageable. If the dog pulls or lunges on a front-clip harness, the dog is less likely to be hurt or injured if the harness is fitted properly. Although dogs and handlers have equipment preferences, the end goal is not to need anything but a leash and collar or harness. The litmus test for excellent leash walking is to remove all but the bare necessities (what is required to comply with local regulations). When a dog can walk nicely on a leash without any extraneous equipment, success has been achieved. If you need equipment to control the dog, the dog needs more training. If you need equipment to control the dog, the dog needs more training. It also means that there is the possibility that the chosen equipment can be punitive, so choose equipment that is the least invasive. My preference is a well-fitted front-clip harness. Completing the "readiness checklist" for loose-leash walking described in this article creates a sense of satisfaction and eagerness to launch the next steps in training the loose-leash walking behavior. Congratulate (treat?) yourself and your dog, take a deep breath, PRACTICE, and gear up for next month's continuation, Loose-Leash Walking: Part Two!